Halloween festivities have started at California’s Great America, as make-up artists prepare actors for the Zombie Maze Saturday afternoon. This year, there will be six haunted mazes including: Dia De Los Muertos, CarnEvil, CornStalkers, Madame Marie’s Massacre Manor, Zombie High and Toy Factory. Halloween Haunt at Great America started on September 26 on Fridays, Saturdays and Sundays and is open till November 1. 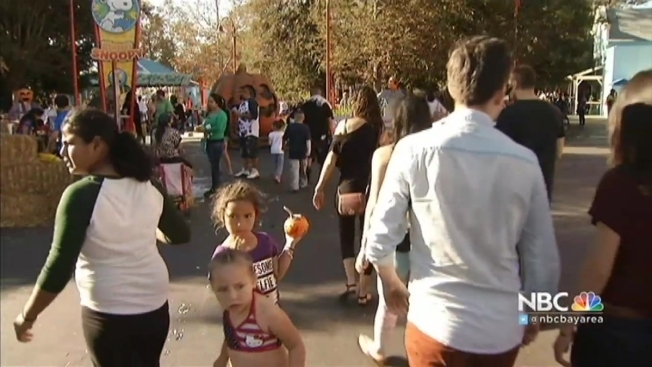 For the young ones, there was a bubble foam pit, pumpkin decorating area, a Snoopy show and other special events. Parents like Antoinette Bush are being extra cautious this Halloween to ensure their kids have a fun and safe evening. Tickets can be found online at www.cagreatamerica.com/haunt with free admission for 2014 and 2015 Gold Pass holders. Halloween Haunt is intended for guests 13 and older.